Between 1978 and 2006, Leonard Cohen produced a body of music that rivals among the finest in his entire canon. Also in this era, he saw his popularity grow exponentially as his albums resonated with critics and audiences on a major scale. No longer a fringe artist with a cult following, Cohen evolved into a full-fledged (if not most-unlikely) pop star. Leonard Cohen Under Review 1978 — 2006 examines this era of the legend’s music, paying particular attention to the context within which it was created and why much of it remains so highly regarded. 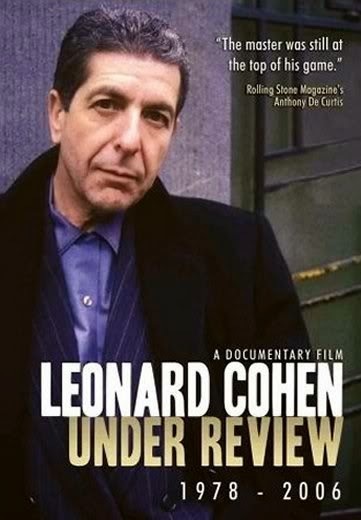 Like other documentaries in the Under Review series, assorted music journalists (like Robert Christgau and Anthony DeCurtis) as well as other subject-relative specialists (like Cohen’s official biographer, Ira Nadel) lend their perceptions and insights. If any songwriter invites such meticulous assessment, it’s Cohen, but thankfully these commentators don’t succumb to tedious, condescending analysis. While it highlights each studio album from Recent Songs to Dear Heather, the film uses Death of a Ladies Man, Cohen’s ill-fated 1977 collaboration with Phil Spector, as its thematic spark. Described as nothing short of a “debacle,” the project is evidenced to show that Cohen could only be at his best when he didn’t compromise his creative intent or accommodate anything but his own muse. The documentary’s most astute contention, though, is that Cohen’s latter day ascent in popularity could, in part, be attributed to the recognition afforded him by a series of tribute albums featuring more mainstream performers covering his works. In particular, the 1987 Jennifer Warnes LP, Famous Blue Raincoat, as well as the various artist compilations, I’m Your Fan and Tower of Song: The Songs of Leonard Cohen, exposed Cohen’s songwriting prowess to a mass audience. And after appreciating these interpretive versions from an arguably more palatable perspective, much of that mass audience then sought out their source. That visibility, so goes the assertion, thus enabled Cohen, upon the 1988 release of I’m Your Man, to reach and ultimately appeal to an unprecedented number of listeners. Unanimously acknowledged in the documentary as a masterpiece, the album catalyzed Cohen’s music career while subsequent efforts—most notably, The Future, with its prophesied, apocalyptic motif—substantiated his newfound distinction. As well, his voice having taken on a deep and sobering tone around this time, Cohen invested gravitas into his songs that rendered him an affecting vocalist in his own right. A clear and convincing case is made in Leonard Cohen Under Review 1978 — 2006 as to how and why the music Cohen produced in this era so crucially factors into his overall renown. There are, of course, a multitude of reasons why, at age 74, Leonard Cohen still draws sell-out audiences in venues the world over. Nevertheless, this documentary addresses a few of them quite well.